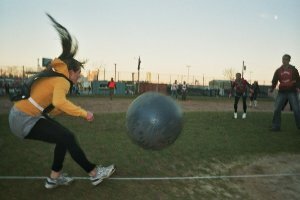 Circle Rules Football is a new, action packed team sport played on a circular field with a giant yoga ball. The winner of Come Out & Play Festival's "Best in Festival" returns for another bout. 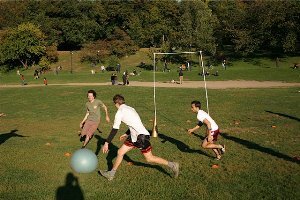 Use your skills in soccer, basketball, volleyball, and wrestling on a giant yoga ball in a circular field with your goal in the center. 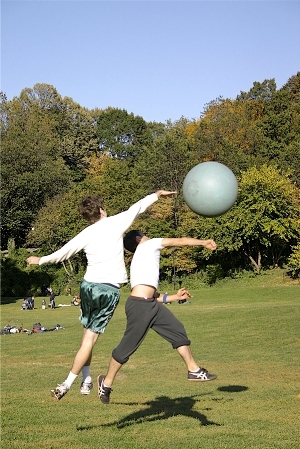 Circle Rules is an action packed new team sport that levels the playing field for long time athletes and newcomers alike. With halftime shows, mascots, play-by-play commentary and hordes of screaming fans, you�ll wish you�d grown up playing. Music, Food, Watch, Play, Win. 110% recommended. Gregory Manley is an actor who has performed recently in New York City with The Mettawee River Theatre Company, The Talking Band, and Theatre Lila. He is a graduate of the Experimental Theatre Wing at NYU�s Tisch School of the Arts, where he created and produced Circle Rules Football in December 2006. He is the chief coordinator of the sport and commissioner of the Brooklyn Chapter. Andrew R. Butler is a theatre artist, actor, and singer-songwriter hailing from the Florida Panhandle. He recently graduated from New York University (at the Experimental Theatre Wing) where he had the good fortune to work with directors Kevin Kuhlke, Tea Alagic, John Jesurun, and Elizabeth Swados. He's currently developing a musical puppet tragedy and launching his sketch comedy group Tenured Faculty. Andrew has been playing CRF for as long as it has existed. He introduced the sport to the Tallahassee region and started an ongoing weekly game in Prague last fall. Ingrid Burrington is a designer, printer, editor, and writer based in Baltimore, MD. Her website is www.lifewinning.com. Scott Riehs is an actor/film maker originally from Philadelphia. He graduated from the Experimental Theatre Wing at NYU's Tisch School of the arts with a B.FA in Drama. In 2008, he traveled to Southern China to shoot his first feature documentary, titled I Found God in China. He is also a playwright, director, and composer. Scott has been involved with Circle Rules Football since its conception, and serves now as the videographer and Philadelphia commissioner . Zaq Landsberg is a Brooklyn based visual artist. He specializes in large scale, site specific sculptures, absurd objects and potentially treasonous conceptual art projects. He had his first solo show in Los Angeles in 2008. He has been in several group exhibitions around New York City and Los Angeles as well as built sculptures in the middle of the Utah desert. His past projects have included a giant cowering pi�ata, a 1:1 scale Apache Assault helicopter made of cardboard and a semi-autonomous nation called Zaqistan. He has a BFA from NYU. Billy Scafuri is a writer/comedian who has co-created such projects as the award winning sketch comedy team, Harvard Sailing Team and the weekly webcomic, The Librarianist. Sometimes giant companies like Pepsi and Comcast ask Billy to write commercials for them - which is laughable (and lucrative.) His recent weekdays have been spent working on a comedy rap album with his rap group, Snakes, while his Sundays are fully committed to Circle Rules Football; sorry church. He's played CRF at Burning Man too(again, sorry church.) For more info on Billy, check out his website, www.Oprah.com. Celeste Arias is a New York City based actor. NYC credits include Measure for Measure (New York Neoclassical Ensemble), Mosheh (Here Arts Center), The Footage (Flea Theater), 200 Mystical Fictions (NYC Fringe), Everyman (The Looking Glass Theatre), OTMA, Hecuba and There Was and There Wasn't (NYU). She has served as the Portland, Oregon commissioner for Circle Rules Football and Harvest Tournament referee. BFA New York University, Tisch.